It’s one of my favourite images from the Space Age. The Large Angle and Spectrometric Coronagraph (LASCO) took it on 15 May 2000. 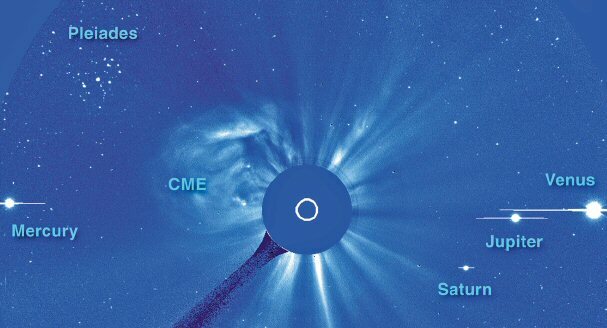 Four planets and the Pleiades star cluster were almost in line with the Sun – which chose this theatrical moment to blast off a huge puff of gas in a coronal mass ejection (CME). So I’m not surprised to find the picture in Our Explosive Sun by Pål Brekke, a colourful book that’s just been published by Springer. 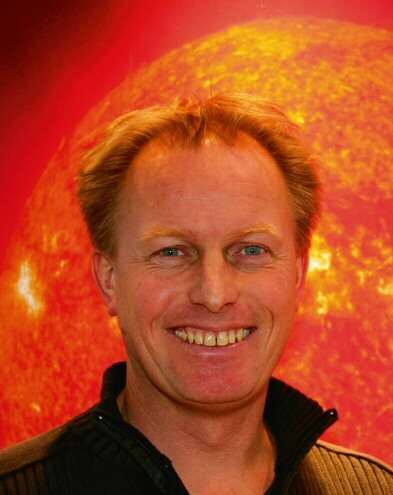 Pål (pronounced Paul) is a Norwegian solar physicist who worked in the SOHO team for more than a decade, latterly as Deputy Project Scientist. We’ve known each other well from the time when I was writing a lot for the European Space Agency. Pål’s now a Senior Advisor at the Norwegian Space Centre. Let’s be clear that Our Explosive Sun is a book for beginners, be they amateur astronomers, aurora watchers, high school students, or interested non-experts of any description. There’s plenty of elementary information about our mother star and the Solar System, and about how to observe the Sun safely or photograph the Northern Lights. Making the book distinctive are a mass of extraordinarily vivid and up to date illustrations, plus the occasional insights you get only from a true expert. For example, in warning of the dangers that solar explosions will pose to astronauts flying to the Moon or Mars, Pål reminds us that the lunar flights of Apollos 16 and 17, in April and December 1972, were lucky to miss a big burst of deadly solar protons in August of that year. And in explaining the distances of stars, he notes that in about 40 years time an astronomer with a supertelescope on a planet in the Pleiades star cluster might in principle see Galileo turning his own telescope on the Pleaides for the first time, from a distance of 440 light-years. It’s a pity perhaps that Pål doesn’t mention cosmic rays, which provide one of the great markers of solar variations both currently and in the past. And his remarks on solar activity and climate change are brief and rather cautious, e.g. : One thousand years ago, it was warmer on Greenland than today. … Human-driven climate change will work in addition to natural climate variability mainly caused by the Sun. This entry was posted on Sunday, January 22nd, 2012 at 17:00 and is filed under 5 Pick of the pics. You can follow any responses to this entry through the RSS 2.0 feed. You can leave a response, or trackback from your own site. Thanks for the tip on the book. Sounds like it’s my scope and speed. I had a great release presentation – a full house at one of Washington DCs best high resolution auditorium.